This year has been such a thrilling year for our family. 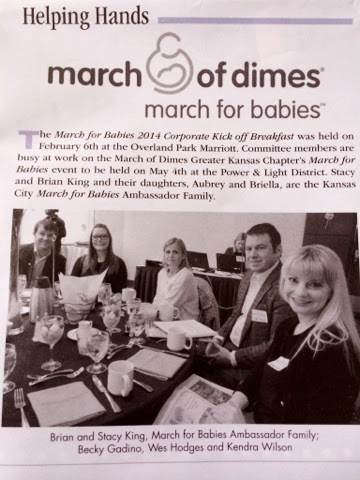 We were so honored to be named Kansas City's 2014 March of Dimes Ambassador family. 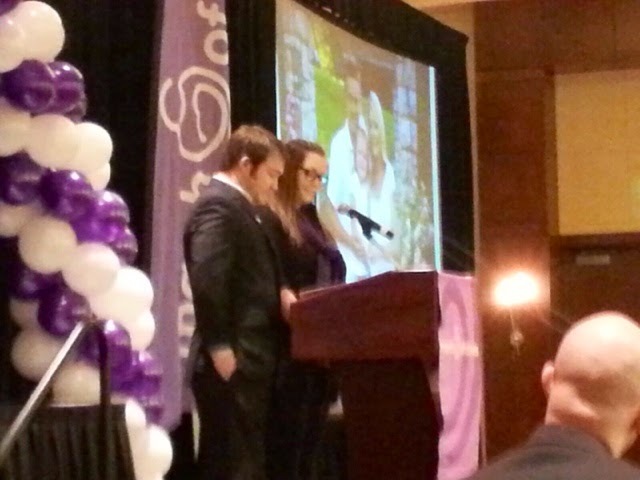 We started off the year in February speaking at the Corporate Kickoff. Brian and I both took turns telling our story, Briella's story. Brian doesn't speak of the night Briella was born, it's very hard for him as he had no idea she was being born as the staff told us I was just in pain not labor over and over and he believed them. So while he was speaking about how he turned around and there was a tiny baby on the warmer, he had to take a moment to get himself together as he started to get emotional. It's tough reliving the hardest moments of our life, but if by doing so we are able to raise awareness and funds so that it might not happen to another family then it's so worth it. We had three or four interviews with local news stations. 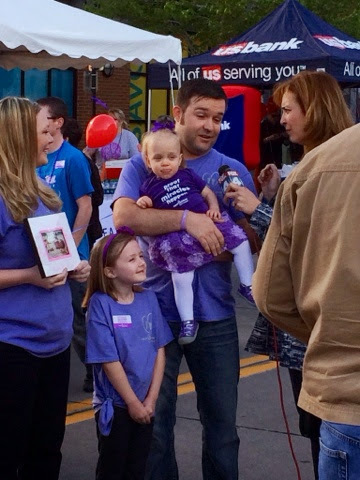 One which Briella cried the whole time and another which she stuck out her tongue the entire interview. 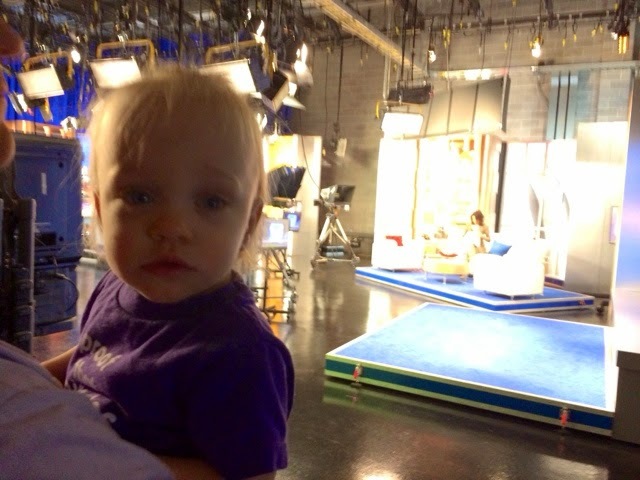 Never a dull moment with Live tv & toddlers. The day of the walk went by so fast. 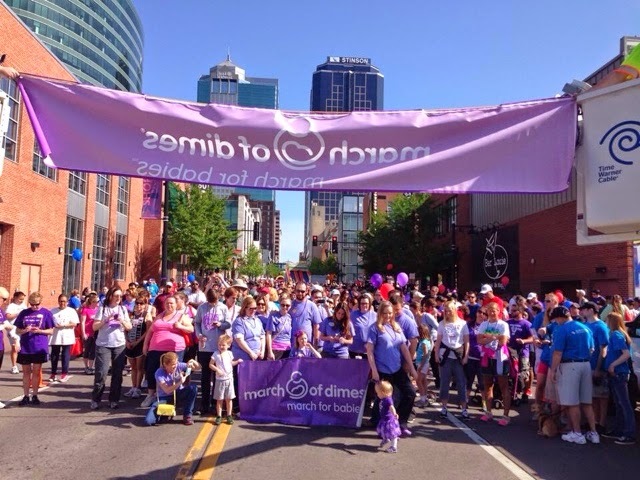 We arrived early, did two interviews, stopped by the Overland Park Regional Medical Center's booth to visit with Briella's nurses, then we went to the stage area to get ready to speak. 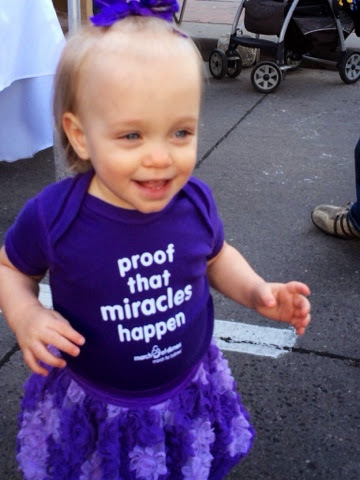 While we were speaking, Briella kept pulling her purple onesie over her face as she was trying to find her belly button. It was hard not to laugh. After speaking we were taken by golf cart to the front of the line at the race. 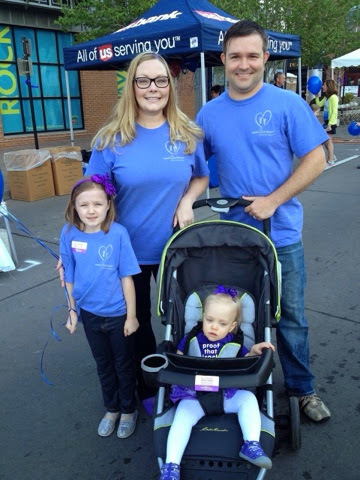 Briella was able to take the first steps and walk a block herself in this years walk. How cool is that?! 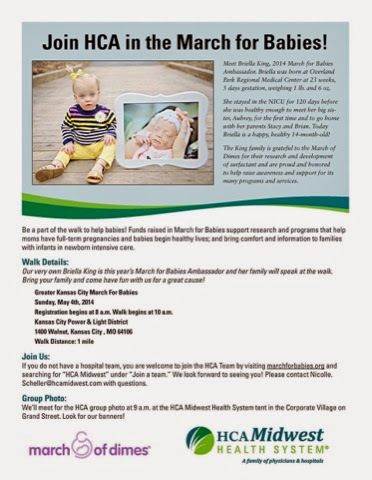 We had so many people put in a lot of work fundraising this year so that Briella's Journey could be one of the top family teams in KC. 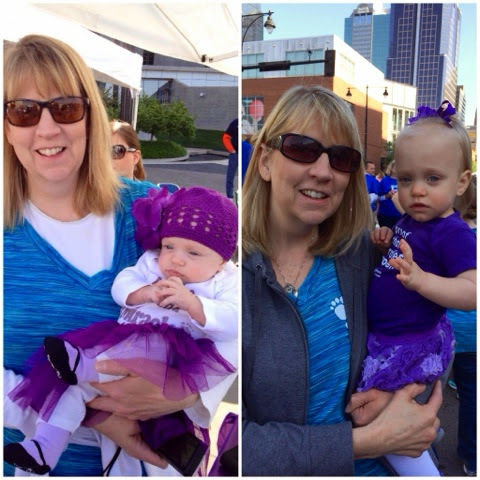 I'd like to give a huge Thank You to Becki Gadino, who raised $1,000! And to my parents who donated $600+ donated lots of hours on various fundraising activities also. 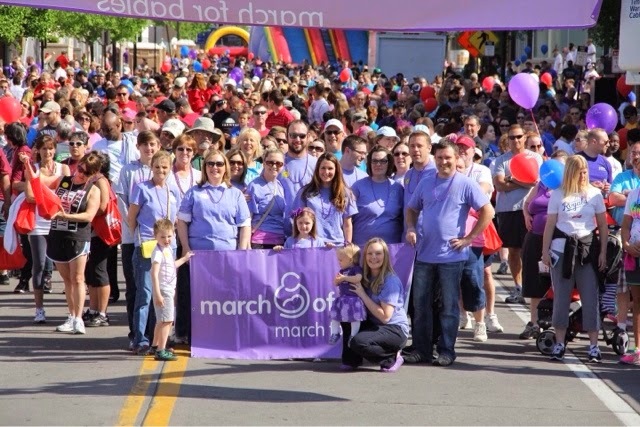 Also thank you to the Heartland Youth Foundation who chose March of Dimes as their main sponsor for their 2014 Charity Challenge girls ASA softball tournament. 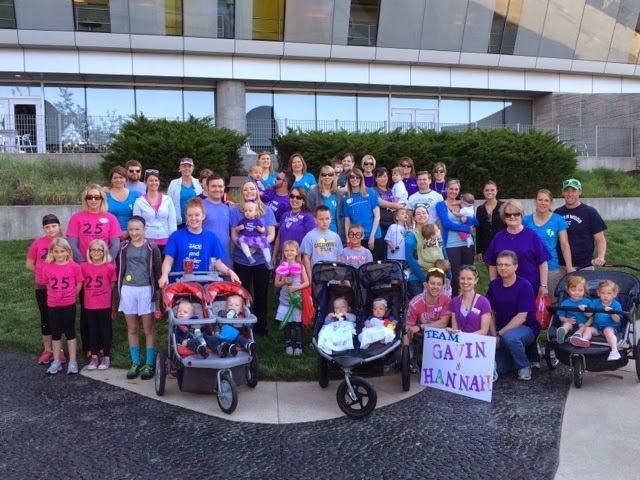 They helped us raise an additional $1100! 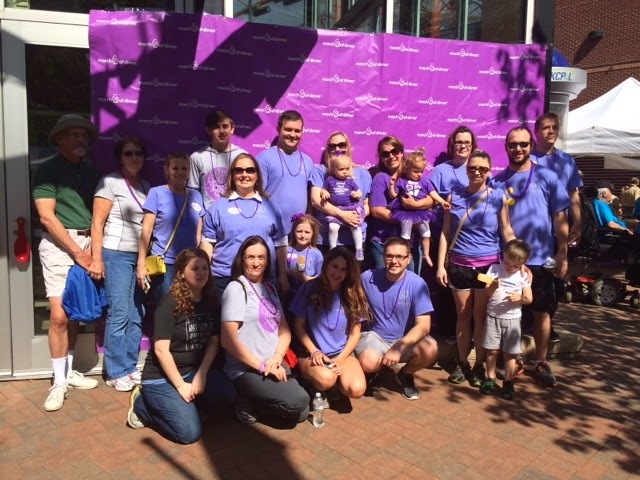 And on a very cool note, Chris Pratt & Anna Faris donated $1,000 to our team this year! 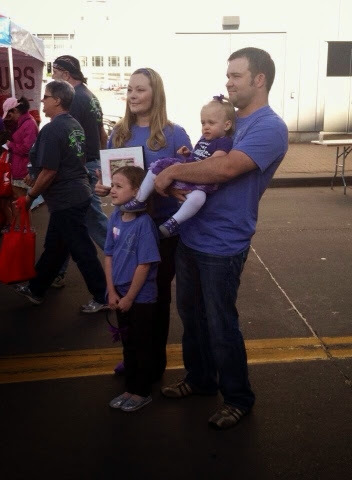 They have a son who is a micro preemie as well so the cause is very near and dear to their heart. 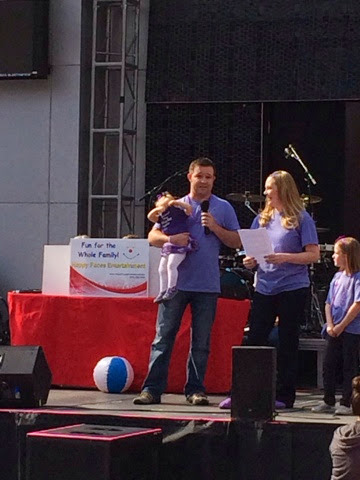 So thank you Chris & Anna for being a part of our mission!!! !